This EA keeps an eye on drawn lines and alerts according specification. It is a semi-automatic robot, which does NOT draw or change any lines. A user can draw them manually or use tools like Trendline-Architect or Channel-Architect, which draw lines automatically. Objects of type OBJ_TREND, OBJ_CHANNEL, OBJ_TRENDBYANGLE, OBJ_REGRESSION, OBJ_STDDEVCHANNEL and OBJ_FIBOCHANNEL will be detected - others will be ignored. The lines or channels have to have valid coordinates and rayed to the right, otherwise the value will be zero. Although channel objects are usually composed of two or more lines, this EA recognizes only the mainline (the one with two basepoints). The line type and the trade direction of a recognized line can be determined automatically or can be set manually. Around recognized lines, there will be a zone called ActionArea. The nearest ActionAreas to the current price for long and short trades are shown on the chart. If the current price is in this zone, an alarm will be triggered and the triggered trade direction will be deselected for this line. If false, the line type is set to NONE by default. Changes apply only to new lines or the first time the EA is activated on a chart. A user can change the line type for each line by clicking the button. The button displays the current line type and is green when in automatic mode. ATR-period defines the period of the ATR calculation. The area and distance around the lines where some action happens is measured in ATR. The ATR timeframe is the same as in the chart. min. 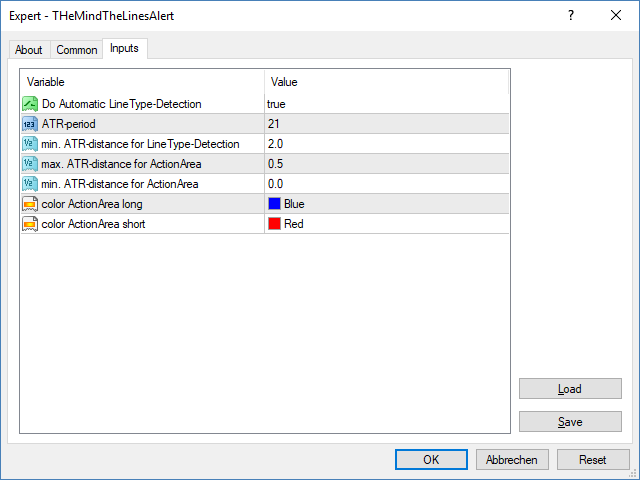 ATR-distance for LineType-Detection is the minimal distance to a line to auto-detect the line type (SUPPORT or RESISTANCE). If the mean value of both values is positive, the action happens before the line is broken. If the mean value of both values is negative, the action happens after the line is broken. color ActionArea long/short defines the color in the chart. Easter egg: there is a simple intelligence included, which recognizes relevant highs and lows, and the EA will open trades after learning the relevance and if there is no drawn line to keep an eye on. Good idea. But without push alerts. Worthless. Who wants to sit all day long in front of the computer?